Type of wine: Medium-bodied, aromatic, dry white. Origin: The most widely planted and most often drunk wine throughout the areas of the Friulia region. Its name is said to be derived from the local word for the small juice-style glass used to serve wine in Friulian taverns and restaurants. While there is some controversy as to whether Tocai Friulano came from Hungary or was exported to it, the grape and the wine it makes have no connection to Tokajii or to France's Tokay d'Alsace. It is believed to be the grape known as Sauvignon Vert. 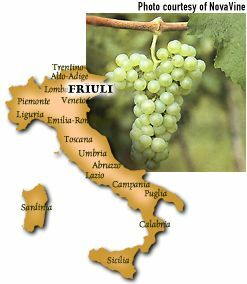 Description: Pale straw-yellow, Tocai Friulano carries an enticing nuance of wildflowers and pears. It is broadly flavored and can offer notes of herbs and citrus. Very nicely balanced acidity heightens the flavors and gives it a long, clean finish. Aging: Tocai Friulano is a wine to drink and enjoy young. FastFoodFacts: Seafood! Especially sushi, clams and grilled shrimp. Stay away from cheeses.